After the experience of travel, your puppy may not eat his/her regular diet. There are many internet sites which give excellent advice from experts on the various diets recommended for the Australian Labradoodle. Your puppy has been eating a diet of Royal Canin Mini Puppy. If you want to change the puppy to a different kibble after it is settled in, the transition should be done slowly combining the Royal Canin with your choice ever increasing the new kibble. Wellness is one brand that offers a puppy kibble that is well balanced and a kibble size that the puppies like. Just be sure to provide a high quality well balanced regular diet for your puppy. Your puppy can be fed two to three times a day according to your schedule. 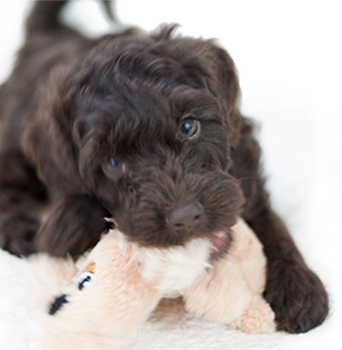 It is important that your puppy take in an adequate amount of food each day, but do not allow overeating. Give the puppy approximately 15-20 minutes to consume its food, and then remove the food until the next scheduled feeding.